6 Shining Modes & 7 Fantastic Light Effect - 3 colors strobe, 3 colors morphing, 3 colors steady, red strobe, green strobe, blue strobe. Press button one time for changing mode,you can choose your favorite color and different modes according to different scenes. At different parties, with different flash speeds, it's definitely the highlight of the party. Party Favor - The gloves perfect for any Parties Costume, role play and dress up, they are also trendy dancing gloves for stage show. Can be used for rave concert, Halloween party and light up show nightclub, theme party, masquerade, stage performance, show off your personality and activate the atmosphere. Also can be used to play the piano at night, hip-hop, parkour, stage props, night cycling. One Size Fits Most - The LED gloves are made with soft and stretchable knit material, and can fit for diffrent hand sizes. 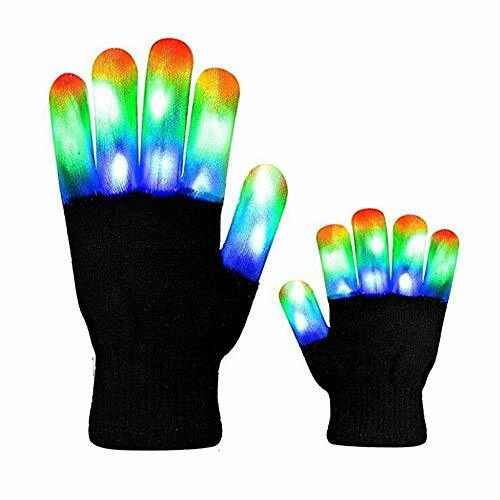 You'll feel warm and comfortable at the cold winter carnival party if you wear the rave gloves. Perfect for 10 - 25 years old. Battery Opeated: 2 CR2016 batteries required, can be easily replaceable after power off, just remove the white insulation paper from the battery before use and insert it again after use to extend battery life. Guarantee - If you have any question with our led luminous gloves, please feel free to contact us, then we will assist you to solvethe problem immediately. Just click"Add to Cart"now!